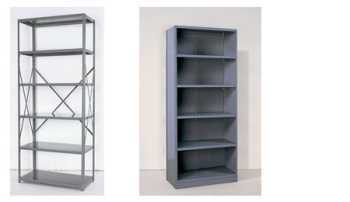 Steel Shelving is versatile, highly adjustable, strong, and durable. It is most commonly used in shops and manufacturing type environments. It stands up well to solvents and liquids. Most industrial shelving has some form of wood deck or open deck. Steel shelving, most commonly, has solid decks made of steel. Heavy duty shelving units can be used for a diverse number of applications. CSI provides heavy duty shelving units in closed or open versions, varying heights, and varying number of shelves in both starter and add-on units. We also offer Rivet Shelving, Wire Shelving, Wide-Span Shelving, as well as Shelving Carts. If you need more storage space within a limited footprint consider Shelf Supported Mezzanines.